One of the toughest questions I get asked regularly is: “How does someone start investing when they have debt?” The reason this is tough is because so many people have unique financial situations. Making blanket statements about when to start investing is tough. 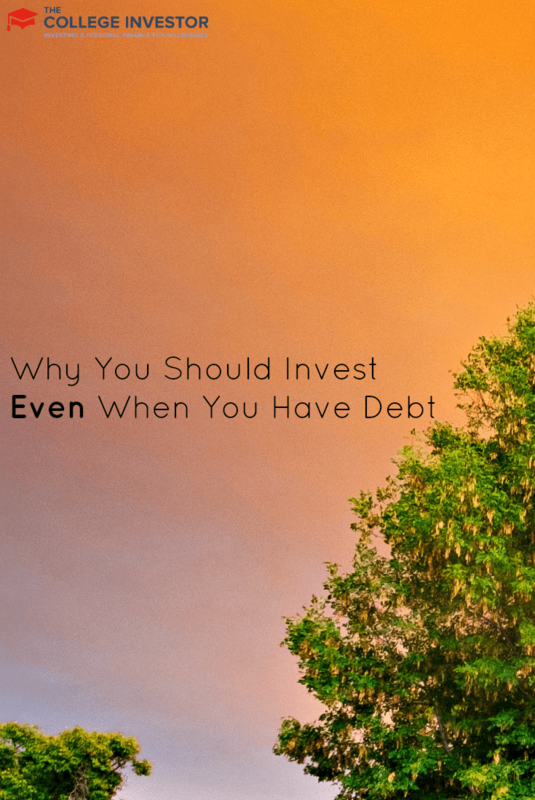 However, over time, I’ve come to find a few truths regarding investing when you have debt, and I wanted to share them with you. If you want to skip this article, remember this: the bottom line is that you can and should invest when you have debt. The important thing is to be smart about it, and here’s how you can do that. As I said above, it’s always a good idea to invest when you have debt. In fact, you can even set yourself up for future success by investing when you have debt. You can make payments and afford your debt service. You can’t afford to pay back your debt. In the first scenario, you can make payments and afford your debt. If this is true, then you should invest like normal — leverage your work 401(k), max out an IRA, and begin to invest in a brokerage account. You should definitely make your debt payments, and invest whatever extra money you have. If you fall into the second scenario, it gets a little trickier. You already can’t afford your debt, so paying it back may not be an option. You should always try to work your debt, whether by negotiating it down, changing your payment terms, or earning more money to pay it back. But if none of these are viable, you’re going to have to claim bankruptcy. In either case, you should still invest — with one caveat . . . . If you can’t afford to make your debt payments, you should still invest, but only for your retirement. If you have a job that offers a 401(k), max it out. Make sure that you have enough money to live off of, but focus more on your 401(k) than your debt (since you can’t afford it anyway). The same is true for an IRA. If you can afford to live and contribute some to an IRA, do it! If you’re going to claim bankruptcy anyway, you should save for retirement instead of making debt payments you cannot afford. Why a 401(k) and an IRA? In bankruptcy, these retirement accounts are protected. You could have $1 million in a 401(k), and still get your debt erased in bankruptcy. That’s why it makes sense to continue to invest, even if you can’t afford your debt. Now that you know that your 401(k) is protected, the only thing you have to remember is to not touch it! Too many people use their retirement accounts to pay off debt, and this is absolutely incorrect. Never take money out of a 401(k) or IRA to pay off debt. Not only will you pay a penalty for withdraw, you’ll also pay tax on the money you withdraw. Then, you’re putting it toward debt that you can’t afford. You basically lose-lose. You lose money for the future. You don’t get a better situation with your debt. You even have to pay more taxes. The bottom line is this: if you are in debt and can invest, do it. It doesn’t matter how much debt you’re in or if you can afford it. If you can invest, you always should. Is there any situation you can think of when you wouldn’t want to invest? From a purely financial standpoint this makes a lot of sense. I think the argument would come more from an ethical standpoint where you feel like if you took on the debt you have a responsibility to pay it back to the extent possible. Obviously our laws don’t require it, as you detail, but it would be tough for me to argue with someone who felt strongly about that. Very true – it’s the difference between ethics and legality. However, debt is a contractual thing – I don’t advise getting into debt beyond the point that you can repay it. But, what I hate even more than that, is people who withdraw from their 401ks to pay off debt! I certainly agree with this. I did it when in credit card debt. I even created a debt payment/savings(investing) allocation plan that put more money toward debt at first, then switched it near the end to invest more. It worked well for me and I am glad that I did it. While we were making the minimum payments on our massive student loans, we still maxed out our Roth IRAs each year or contributed to our 401ks to the employer max. We are aggressively paying down our student loans now, though, so it’s tougher to set aside money for our Roths (although, my spouse continues to contribute up to the employer max on his 401k). I agree with much of what you said in that investing for retirement is critical, but I would also advise that anyone with credit card debt pay that off as quickly as they can. They will not find any investments that pay anywhere near the credit card interest rates they are probably currently paying. Of course investing while paying debt is normal for anyone with a mortgage. And if student loans will take many years to pay off, you should also be investing over that time. I think it is always smart to invest however the amount. You can always increase the amoun tof the investment as you can afford it. Saving and investing should always be a priority. I started my IRA a few years ago. For a while I was only adding $20/mo and I recently increased it to $50. I’ve been on the fence about doing this, so this post is confirming what I thought was the right thing to do. Interesting take. I’m no attorney, but I’m not sure a bankruptcy court would let you get away with shoving cash into a retirement account after it became clear that bankruptcy was inevitable. Considering purely the numbers part of the choice, I’d suggest that paying off debt be considered in the same way one considers prospective investments. Making a debt payment is exactly the same as making an investment with a guaranteed, risk-free, after tax return equal to the interest rate on the debt. So from a financial perspective, a credit card debt with an APR of 18%, for example, is an extremely attractive investment opportunity. You’d be darn lucky to find something better to do with your money other than repaying that debt.